Industrial manipulators that can improve productivity, employee wellbeing and profitability. Indeva UK can provide industrial manipulators for any production line, in any industry, to lift up to 300kg. Our large range of lifting and handling equipment can be supplied with bespoke end-tools, which means we’re able to supply a complete handling solution to meet your exact requirements. Indeva’s industrial manipulators are some of the most advanced material handling tools in the world, and are trusted by many leading cross-sector companies. Send some information about your lifting and handling requirements and we will be in touch! Our industrial manipulators are more compact than traditional lifting equipment and operators will find that they can control and handle heavy loads with great precision and next to no exertion. This feature will provide an immediate response to the operators movement, resulting in fewer manual handling related injuries, such as strains and sprains to the back, shoulders and upper limbs. This allows the operator to place both hands on the load without the need for handles or buttons, giving them complete control of the load. In the event of an emergency, such as a power cut, an Indeva industrial manipulator won’t drop the load, or even move, which not only prevents product damage but ensures employee wellbeing. 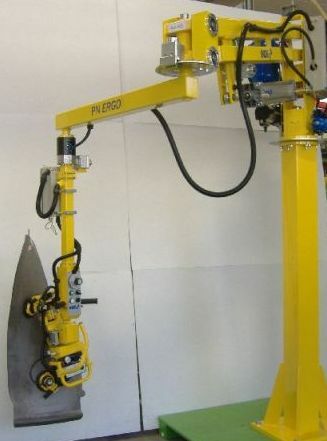 All of our industrial manipulators can be tailored to suit your exact requirements. Whether you need to life, transport or manipulate a load, we’d love to discuss a lifting solution with you. To find our more please call directly on 01246 252 333, or email support@uk-indevagroup.co.uk for a fast response. If you require a site visit, for us to see your production line first hand, or would like to visit our showroom we’d me more than happy to arrange the visit – simply fill in the form at the top of this page.